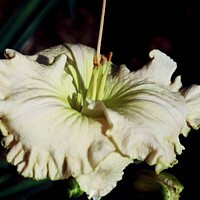 Breeding goal: A tall, white stud plant. 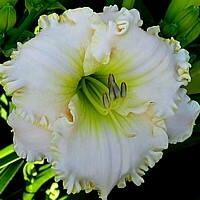 Expectations: 'President Ronald Reagan' is a small flowerd (5.5") evergreen but is tall at 38". 'Silver Surfer' is a 6" dormant, tall at 36". These tall, frilled whites will be useful to cross with Sears Tower progeny. Or anything short, for that matter. As it turns out, this cross runted itself out quite thoroughly. After being started indoors in February, by the time fall came, both seedlings barely had 3 leaves.